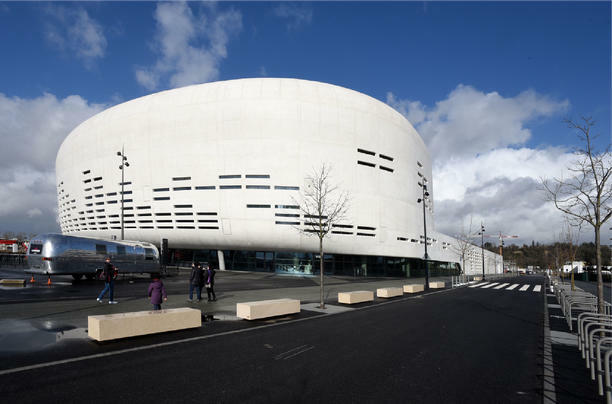 The Bordeaux Métropole Arena is a new venue in Bordeaux (France), designed by famous French Architect Rudy Ricciotti. The shape of the building resembles a giant white pebble. The white concrete envelope is illuminated with a LED system that shines through the openings on the building façade. The hall has a capacity of 11,000 seats for Shows, Concerts, Corporate events and Indoor sports competitions. Besides the fact it is an architectural gem, the building also performs in terms of sustainability as the energy consumption of the building is optimal, all the while providing users with comfortable spaces and a healthy indoor environment. Tarkett contributed to this project by sharing expertise in terms of sustainable building as well as acoustics and traffic resistance throughout the 4,500 m2 of public areas in the building. For high traffic areas, the customer chose the Silencio Veneto Linoleum collection. Like all Linoleum collections, Silencio Veneto is a natural product, 100% recyclable and Cradle to Cradle certified. It also contributes to good indoor air quality thanks to the low level of VOC emissions. This product also offers good acoustic properties and reduces sound by 18dB while providing excellent walking comfort. Last but not least, the SIlencio Veneto Linoleum collection is easy to clean and maintain for even more durability, which is key for a building that will host hundreds of events each year.